Color brownish dorsally and whitish ventrally. Broad rounded disc. Snout short, relatively blunt (hence the name ‘bluntnose’). Spine near base of long whip like tail. Well developed dorsal and ventral fin folds on tail which are dark brown to black in color. Total length, including tail 3.3 feet (1 m). Wingspan of 2.5 feet (78 cm) or more. Weight 6.6 to 33 lbs (3 to 15 kg). This is not well known species, but it is estimated that they live 15-20 years. Found in coastal waters, including estuaries, lagoons and sometimes rivers, of the western Atlantic from Massachusetts to Venezuela. Prefer water depth of 3 to 32 feet (1 to 10m). Benthic species. Bottom feeder. Feeds on small fish, clams, marine worms, and crustaceans (i.e. shrimp, crabs). Aplacental viviparity (fertilized stingray eggs remain in the mother’s uterus, ingesting their yolk sacs. Once the embryos have fully consumed their yolk sacs, the embryos are nourished by ‘uterine milk’, secreted by the mother. Gestation is 10 to 11 months. Two to four pups per litter. Non-aggressive species of little danger to humans with the exception of their defensive venomous barb located near the base of the tail. Avoid handling or exercise extreme caution. 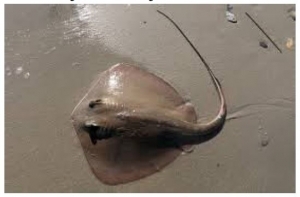 Do the “Stingray shuffle”, drag your feet while walking in shallow, sand-bottom waters. ACKNOWLEDGMENTS: The information contained in this document was gathered from various sources, including Florida Ray Identification Guide.